Step 5: What Image Does the Client Want to Convey? Step 6: How Will Success Be Measured? Step 7: What is the Client Budget? If you’d asked me two years ago to show you how to write a design brief, I’d have said no. I know that sounds melodramatic, but it’s my way of saying that I didn’t like design briefs. I’d seen too many of them that were as original, meaningful, and appealing as another Kardashian. I also didn’t see anything they offered that couldn’t be addressed in a good brand manual. Then, one day, my friend Mike did what he usually does when I don’t like something: he challenged me to do it better. Since I can’t afford for Mike to be right, I did. In the process, I learned that my original opinion of design briefs was wrong. When done correctly, a design brief is like a roadmap that defines the scope, goals, and strategy of a creative project. Whether you’re a solo designer or part of a creative agency, a good design brief can also be a blueprint to professional success. What do you love the most about your company? What do your clients/customers say about you? The answers can provide the insights you need for a description that truly describes the business, instead of a cliched summary that could apply to any company in the client’s field. 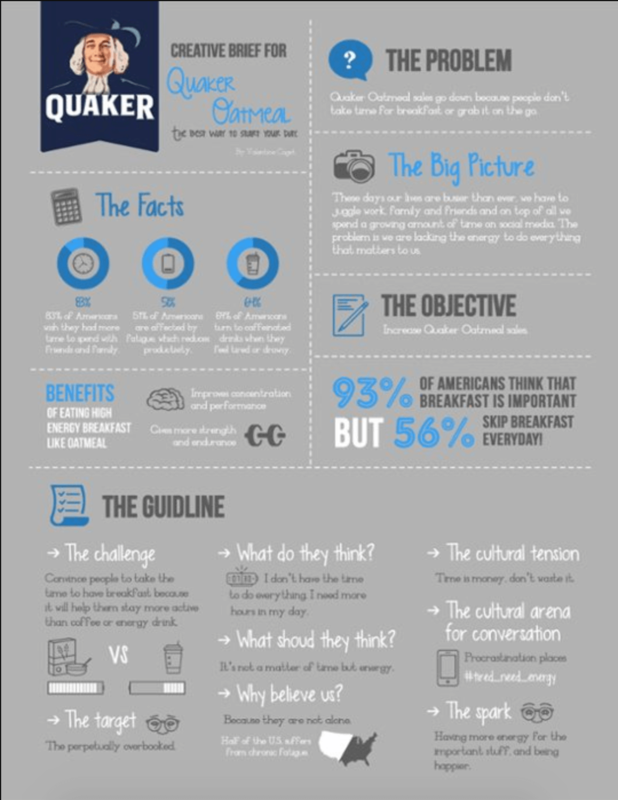 Example: This creative brief for a snack food brand has a concise yet meaningful client background section. Note how it describes the product’s unique packaging, distribution challenges, and customer base. This step answers the most critical question of all. What is the project? When people think about your brand, what feelings and associations do you want them to have? Are there copy requirements – is there a product descriptor or general brand message/tagline? What are the functional and emotional benefits your company delivers to customers? Are there any aesthetic preferences or reference materials the client might be inspired by? What deliverables are you looking for? Once you have these answers, clarify the deadline or, if there are several assets involved, deadlines so you can reasonably estimate when the client should receive the first draft of the new brand design. If the client needs to meet a publication deadline, confirm the date so that you have time to make changes to deliverables before they are needed. 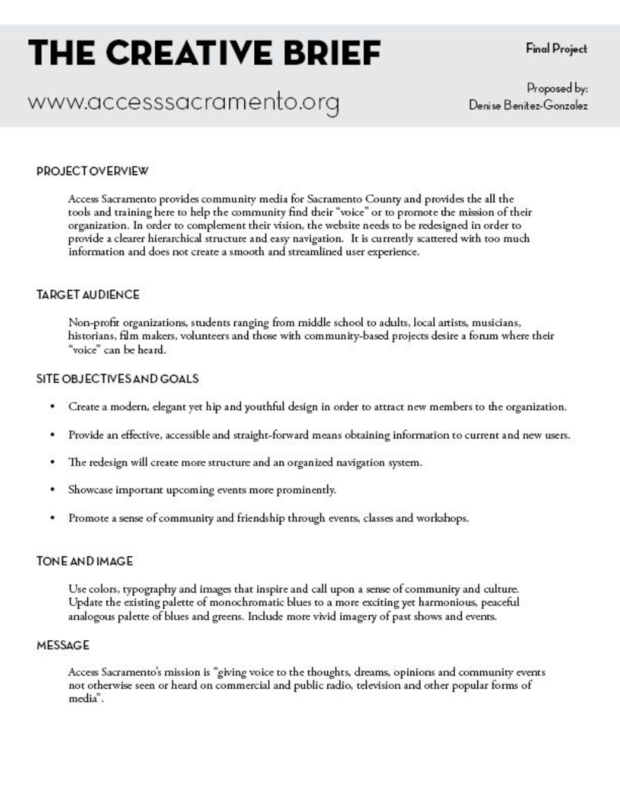 Example: This brief for a community project website was especially detailed regarding preferred colors, images, and typography. How much do they earn on average? The goal is to put a face to that customer. In sales, the term is ‘buyer persona.’ Is he a home-based entrepreneur in his early thirties? Is she a busy female professional who’s only been out of college a few years? How often do they buy your client’s product or use their service, and why? Example: This design brief for a well-known online payment system is missing some of the details that belong in a creative brief, but its target market section is excellent, with details about the age group and how the service addresses their pain points. The goal of a fresh new brand design is to make the client stand out, and part of that strategy is understanding the competition. Ask the client how they are different, or want to be perceived as different, from their competitors. For example, your client sells candles scented with essential oil. So does the competition. The difference is in how they present themselves to their audience. Your client is a luxury brand sold in upscale boutiques and department stores. Their customers tend to be higher-income professionals who like the idea of natural scenting in their home or office. Their main competitor supplies candles to natural product stores, where the clientele is younger and environmentally conscious in all aspects of their lives. Example: In this design brief for a popular footwear brand, several competitors are listed, although there is little information about how the brand can stand out among them. This isn’t a huge issue here because all brands are widely known, but a design brief for a company that isn’t a household name should have more competitor details. What image or impression does the client want to convey to their customers? Do they want to be perceived as upscale or down-to-earth? Leading-edge or comfortably nostalgic and earthy? Your candle client’s branding aesthetic tends to be elegant and sophisticated, so cursive fonts and neutral colors might be appropriate. Never assume, though, and remember that their concept of classy may be different from yours. Ask them what colors and typography style they’re willing to consider and which ones are an absolute no-go. If they’re unsure, it helps to have them submit at least ten downloaded images of branding that they like. You’ll probably see a common denominator that tells you what their preferences are. With a new design alone, it can be tricky to measure results, so try to find out how a brand redesign fits into the client’s overall business plan. If you were designing a special landing page on their website instead, success could be measured by the number of click-throughs or product purchases. Example: This bold and unique-looking brief for a major oatmeal brand identifies the goal as “increasing oatmeal sales.” No percentage is assigned, but the brief makes it clear that success will be measured by increased sales. Confirm the client’s budget, as this dictates the resources you will use. If you are carrying out any services in addition to the brand design, specify how much of the budget should be spent on each service or asset. Your goal is to clarify the budget in writing to avoid misunderstandings later. Get the name and contact details for the person who will be the primary contact for the design project. If they aren’t also the one who will sign off on it, find out who is. If anyone else is involved in the approvals process, get their contact information too. Once you’ve compiled all of the information you need, write a clear and detailed brief. A well-researched and written design brief maximizes the chance of an end product the client will love- in this instance, a new brand design for the scented candle company. If you know their target audience and budget, have all the necessary materials, and understand how the client will measure success, you will be able to instruct the designer accordingly and remain an important partner in helping your client achieve their goals. Once the creative brief is complete, it’s time to manage your new project. 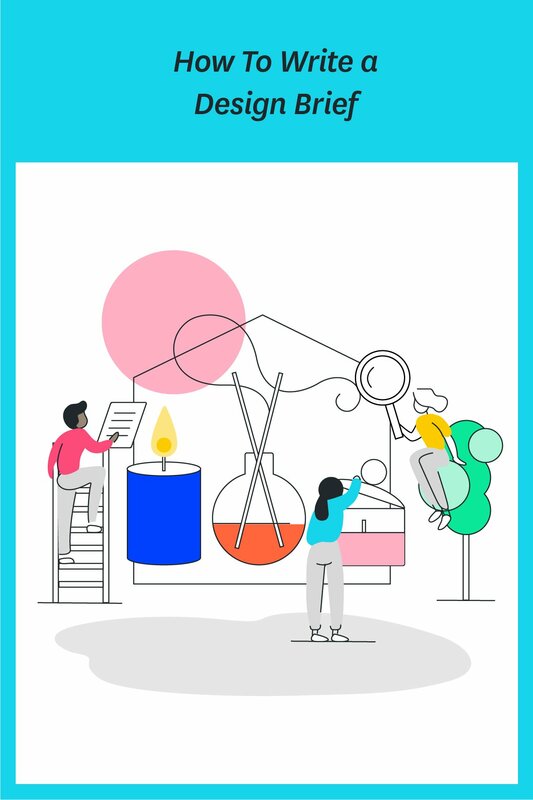 One project management tool that’s popular among creative agencies is Teamweek, a browser-based resource that uses color-coded project timelines to organize, oversee, and manage your design team. 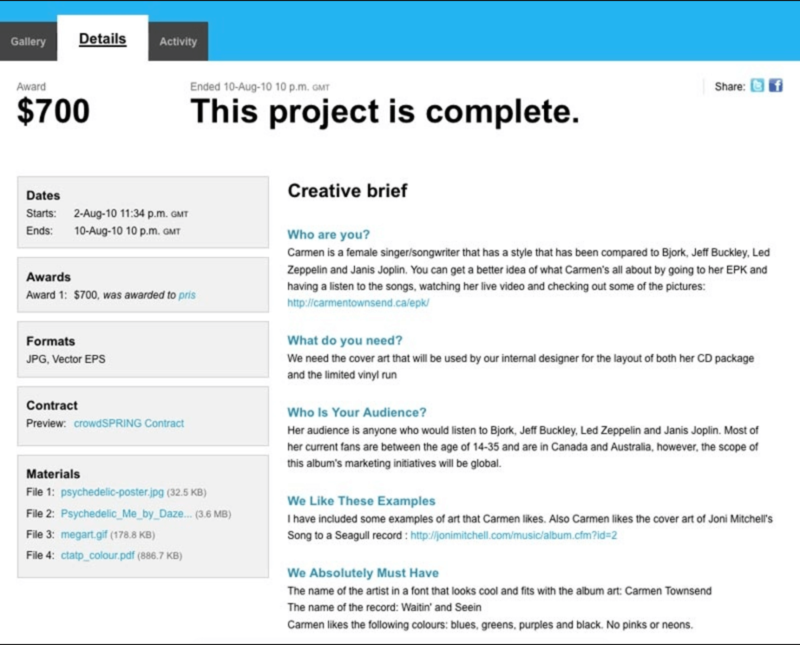 Creative teams love that it’s so easy to use and gives you a clear visual overview of your projects. Best of all, there’s a free trial available, so you have nothing to lose and a valuable agency asset to gain!